Lyme Disease - body, last, Do Many People Get Lyme Disease? Lyme (LIME) disease is a bacterial infection that is spread to humans by the bite of an infected tick. It begins with a distinctive rash and/or flulike symptoms and, in some cases, can progress to a more serious disease with complications affecting other body organs. 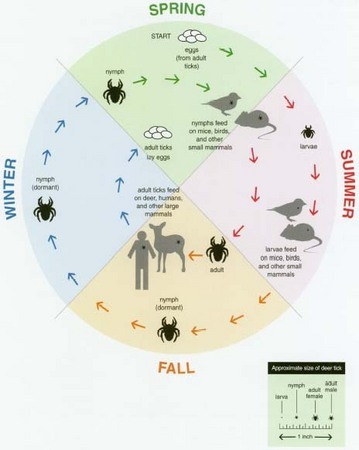 The life cycle of a tick takes 2 years to complete. In the spring, eggs hatch into larvae, which feed on mice, birds, and small mammals until the fall, when they become dormant. The following spring they molt into nymphs, which feed through the summer and then become adults in the fall. At any of these stages of growth, ticks may become infected with Lyme disease bacteria by feeding on infected animals; as adults they may feed on humans and transmit the bacteria that cause the disease. can progress to affect the joints, heart, and nervous system, especially in adults. Lyme disease is caused by a corkscrew-shaped bacterium called Borrelia burgdorferi (buh-REEL-e-uh burg-DOR-fe-ree). It is most commonly carried by very small, immature ticks of the Ixodes (iks-O-deez) group called deer ticks or black-legged ticks. Deer ticks spread Lyme disease in the northeast, midwest, and some other parts of the United States; another kind of Ixodes tick, the western black-legged tick, is the source of Lyme disease in the western United States. Lyme disease also occurs in other countries such as China, Japan, and some countries in Europe. Lyme disease is not spread from person to person. It is spread by ticks that become infected with Borrelia burgdorferi after feeding on an animal, usually a mouse. Ticks then pass the bacteria to humans while attached to the person's skin and feeding on blood. To infect a human, the tick must be attached for at least 24 hours. Just because people are bitten by a tick does not mean that they will get Lyme disease; most tick bites do not cause disease. Do Many People Get Lyme Disease? More than 16,000 cases of Lyme disease occur each year in the United States, according to the U.S. Centers for Disease Control and Prevention (CDC). Although cases of Lyme disease have been reported in nearly every state, most cases are reported from the northeastern states, including New York, Connecticut, Massachusetts, Rhode Island, New Hampshire, Pennsylvania, New Jersey, Delaware, and Maryland, and from Minnesota, Wisconsin, and California. These areas contain natural habitats of Ixodes ticks. People who live, play, or work in tick-infested wooded areas or overgrown brush are most at risk of getting the disease. Lyme disease is most common during the late spring and summer months in the United States (May through September), when ticks are most active and people are frequently outdoors. Immature Ixodes ticks (called nymph ticks) are about the size of a poppy-seed. Adult ticks are only the size of a sesame seed. * Iymph (LIMF) nodes are small, bean-shaped masses of tissue that contain immune system cells that fight harmful microorganisms. Lymph nodes may swell during infections. What Happens When a Person Has Lyme Disease? Within a few days to weeks after being bitten by an infected tick, about 80 percent of people develop a red circular rash known as erythema migrans (air-uh-THEE-muh MY-granz) at the site of the bite. The center of the rash may clear as it grows, giving the appearance of a bull's-eye pattern. The rash may feel warm, but it is usually not painful or itchy. Other symptoms in the early stage of Lyme disease may include tiredness, fever, chills, joint pain, muscle aches, headache, stiff neck, and swollen lymph nodes * (glands). Some people have no noticeable symptoms or only have the non-specific, flulike symptoms such as fever and headache. 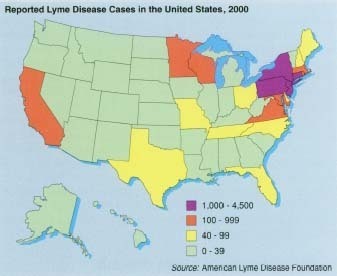 As is evident in this map showing the occurrence of Lyme disease in the United States for the year 2000, most of the cases came from the northeastern, north-central, and mid-Atlantic states. In all, 95 percent were identified in Connecticut, Rhode Island, New Jersey, New York, Massachusetts, Delaware, Pennsylvania, Maryland, Wisconsin, Minnesota, New Hampshire, and Vermont. If untreated, Lyme disease can progress to the next stage, called the early disseminated stage, as the infection spreads and starts to affect certain body functions. This more advanced stage appears a few weeks to as long as 3 months after a bite by an infected tick. Symptoms may include two or more areas of rash, severe headache, severe tiredness, stiffness (especially in the joints and neck), one-sided facial paralysis * (Bell's palsy * ), tingling or numbness in the legs and arms, irregular heartbeat, fever, and meningitis * . A late stage of Lyme disease may develop weeks to years later if the disease remains untreated. In this stage, symptoms can include chronic * Lyme arthritis (episodes of pain and swelling in the joints, especially in the arms and legs), memory loss (which is rare in children and teens), and numbness in the hands, arms, legs, and feet. Diagnosing Lyme disease can be difficult because the symptoms often look like those of other diseases. A known recent tick bite or the erythema migrans rash are often key to the diagnosis of Lyme disease. Following a physical examination and medical history that includes asking about exposure to tick-infested areas, the doctor may order blood tests that look for the presence of antibodies * to Borrelia burgdorferi. If any joints are swollen or signs of meningitis are present, joint fluid or spinal fluid is sometimes tested for Lyme disease. Some blood tests for Lyme disease can give false negative results, particularly if done within the first month after infection. False positive test results can also occur. Because of this, doctors may have difficulty interpreting Lyme disease test results and confirming the diagnosis. Lyme disease is usually treated with antibiotics taken for 3 to 4 weeks. Antibiotics are usually taken by mouth, but in severe or advanced cases of Lyme disease they may be given by injection. If treatment begins at the early stage of the disease, a complete cure is likely; it generally takes a few weeks or months for the symptoms to go away. Sometimes symptoms recur, making it necessary for a patient to take another course of antibiotics. If treatment is not started until later in the progression of the disease (at the early disseminated or late stage), antibiotics still work but recovery may take longer; the patient's symptoms may last for months or even years. Children usually recover from Lyme disease faster and with fewer complications than do adults. Wear light-colored clothing so that ticks can be spotted easily. Keep arms and legs covered. Wear high rubber boots, because ticks usually are found close to the ground. Tuck shirts into pants and pants into socks or boots to help keep ticks from reaching the skin. Shower and wash clothing after being in tick-infested areas. Inspect pets for ticks after they have been in the woods. Applying insect repellents containing 10 percent DEET (n, n-diethyl-m toluamide), which is safe to use on children and adults, on both clothes and exposed skin, and permethrin (per-ME-thrin) (which kills ticks on contact) on clothes, may also help reduce the risk of tick attachment. If ticks are found attached to skin, they should be carefully removed with tweezers or forceps. A vaccine to prevent Lyme disease has been developed but is not currently available for use while it is being evaluated for possible side effects. Second, using tweezers, gently grasp the tick as close to the skin as possible and pull straight back slowly and steadily to reduce the risk of squeezing more bacteria into the bite. Third, wipe the area with alcohol or an antiseptic. Lastly, place the tick in a jar of rubbing alcohol to kill it. Monroe, Judy. Lyme Disease. Mankato, MN: Capstone Press, 2001. National Center for Infectious Diseases, U.S. Centers for Disease Control and Prevention, Mailstop C-14, 1600 Clifton Road, Atlanta, GA 30333. The website for this U.S. government agency provides information about Lyme disease. KidsHealth.org . KidsHealth is a website created by the medical experts of the Nemours Foundation and is devoted to issues of children's health. It contains articles on a variety of health topics, including Lyme disease.